Seems like Capcom is trying to dig into their back catalog for new releases. For example, they recently came back with an ACTUAL sequel for the Street Fighter series, and they are coming out with Super Street Fighter 4. They recently released a new game in the Bionic Commando franchise. Sadly, it wasn’t received with the grace they were looking for at Capcom. Let’s turn back the clock though, and go back to its beginnings, find its roots, look up its origins. The farthest back I went is in the arcades with its first game. Let’s see how well it stands up by today’s standards. The setting takes place 10 years after a war between two factions happened. The game follows a specially trained commando with a bionic arm that must infiltrate the other side and destroy their plans and save your faction from the evil grasp of the others. This plot reminds me of a lot of stuff revolving around action games, like Contra and Metal Slug. The game play in the arcade version of Bionic Commando is basically a run-and-gun plat-former where you control the commando and, well, shoot whatever gets in your way. An interesting gimmick is that you can’t jump. Instead of relying on the jump button to get from point A to point B, you have to use your bionic arm to grapple onto things and climb on them and such. It’s interesting since it kind of reminds me of a 2D Batman Arkham Asylum since Batman can’t jump and requires the bat hook to get to most places out of reach by the enemy. You can also get upgrades for your gun, and you can shoot down floating crates to gain more points. The graphics in the game are pretty good. 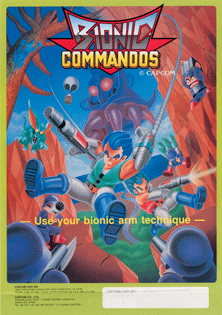 The characters and such remind me of the Bionic Commando game made for the Gameboy. So, I guess if you liked the designs on the Gameboy, then you will like the designs of the characters on this game just fine. I also like the music for this game. It has a very good action-like feel that puts you into the intense game play of Bionic Commando. The person responsible for this is Harumi Fujita who is known for his work on Tomba, Strider on the NES, Tiger Road, and Willow on the NES. I say he did a great job because the game gets pretty difficult when the action gets intense, and how unusual the main gimmick of the game is. This game might be a little too tough for some people. To be honest, I really don’t like this game as much, though I will explain why in the bad parts of the game. I’m sorry this review is short. Let’s grapple onto the bad parts of the game. I don’t like how you can’t jump. It’s very hard to dodge by using your bionic arm and you will end up dying a lot if you are not use to using the bionic arm, like me. I also hate the bionic arm feature. It makes getting around very sluggish and awkward. I hate how difficult this game is. I say it’s almost as difficult as Ghost and Goblins since if you get hit once, you die. I also hate how when you get hit, you are sent flying backwards, and if you are on top of a platform and if you are hit, you can fly off and end up at the beginning of the bottom part of that level or something. I also hate when you parachute into the level and then detach from the parachute, you can get hit and end up flying backwards again. It’s so annoying. You also can’t aim your gun in any other direction, meaning you can only shoot straight. Ugh. That’s so stupid of Capcom to do this! My final gripe with this game is that it’s too short. It’s only 5 levels, and if you can even be patient enough to get through the first level, then you can easily get to the 5th level in a bout 15 minutes. Overall, I can see why the NES and the Xboxlive versions are more memorable and better than this game. This is a horrible arcade game, and I can see why I never saw one of these arcade machines in the arcades when I went to one. If you are looking for a GOOD Bionic Commando game, I say play the NES version on Capcom Classics Collection Mini Mix on the GBA or download the Xboxlive version off your 360. I wonder whom they were aiming at for this game. It’s too hard for a lot of players, and this version is better left forgotten. Actually, this will be the second game alongside Virtua Fighter 2 to be on my list of extremely bad games list.